Furry Tails: the Adventures of Mr. Mackie is a lighthearted story about our special pets and the possibility of where they go when they leave us here on Earth. 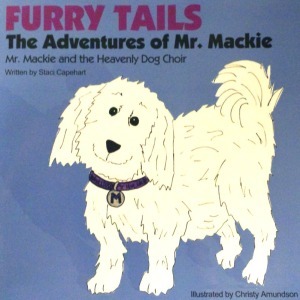 The first book in this series is Mr. Mackie and the Heavenly Dog Choir. Mackie is welcomed into heaven and introduced to Dogdom where he meets up with some friends that arrived before him. He is asked to become the choir director for the Heavenly Dog Choir. Mackie reluctantly accepts the offer and quickly finds it to be a very rewarding experience not only for him but for many others as well. The book is intended to teach all of us the power of acceptance and how we can learn and appreciate the differences of others.